A huge iceberg that’s about twice the size of Manhattan has torn off the Petermann Glacier in Greenland, illustrating another dramatic change to the warming island. For several years, scientists had been watching a long crack near the tip of the northerly Petermann Glacier. 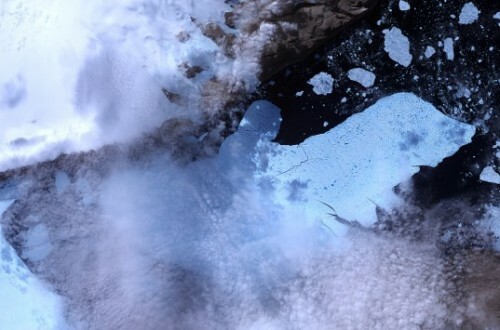 On Monday, July 16, NASA satellites showed it had broken completely, freeing an iceberg measuring 46 square miles. About four-fifths of Greenland is covered by a massive ice sheet; Petermann Glacier is mostly on land, but a segment sticks out over water, and that’s where the break occurred. “It’s one of the manifestations that Greenland is changing very fast,” he said. Researchers suspect global warming is to blame, but can’t prove it conclusively yet. Glaciers do calve icebergs naturally, but what’s happened in the last three years to Petermann is unprecedented, Muenchow and other scientists say. “This is not part of natural variations anymore,” said NASA glaciologist Eric Rignot, who camped on Petermann 10 years ago. Many of Greenland’s southern glaciers have been melting at an unusually rapid pace. It was 15 years ago that my nephew set out on a trek across Greenland, sponsored by Britain’s Royal Geographical Society (RGS). The RGS had supplied him with a topographical map dating back to the 60s, but so much snow and ice had melted since then that the map was of little use in terms of altitude. According to Ted Scambos, lead scientist at the National Snow and Ice Data Center in Boulder, Colorado, the Petermann break brings large ice loss much farther north than in the past. If it continues, and more of the Petermann is lost, the melting would push up sea levels. It’s more than glaciers in Greenland that are melting. Scientists also reported this week that the Arctic had the largest sea ice loss on record for June. This entry was posted in News and tagged 46 Square Miles of Iceberg Break off in Greenland, Care2, Global Warming, Ice, news, Weather. Bookmark the permalink.